Brown eyes are often referred to as being dull and not as much fun as green or blue eyes, but I’ll tell you a little secret: I learned that brown eyes are actually the most versatile of them all! Us brown-eyed girls can get away with wearing almost any shade of eyeshadow and eyeliner without them clashing with our eye colour. Isn’t that great? But if you want to make your brown eyes really stand out, there are a few colours, such as green and purple, which will make your eyes look more beautiful than ever! 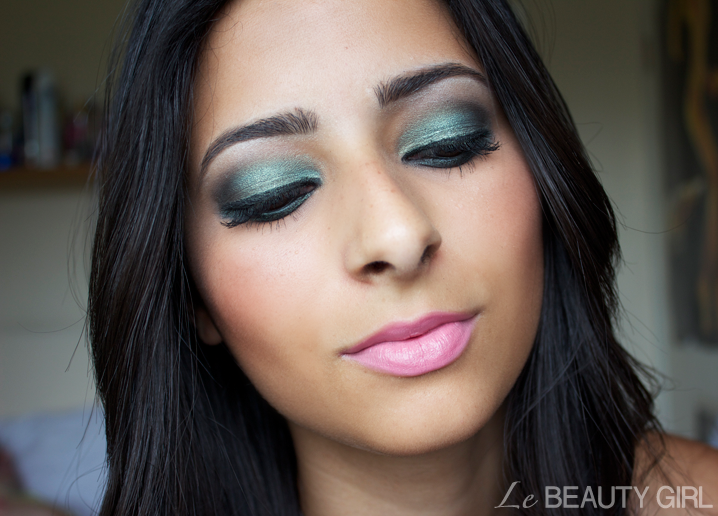 The star of this look is a bluish green with gold pearl eyeshadow from MAC called ‘Steamy’. Green is known for being very complimentary to brown eyes, so I stepped out of my brown and gold comfort zone and ventured into the world of colours. I must say I’m very pleased with the result. I believe the secret to wearing a bright coloured eyeshadow is to blend the edges really well with a dark brown or black eyeshadow, creating a gorgeous smokey eye. Also, make sure you define your eye as much as possible to make the colours clearly stand out. I went for a thick black line on my upper lash line and a smokey line of green and black on the bottom lash line; to get even more definition I also line my upper and lower waterline. I used MAC ‘Nylon’ eyeshadow as a brow bone highlighter, which also helps create a nice contrast with the green eyeshadow. Finally, because the eyes are the most important part of the look, I played down the lips and the cheeks. On my lips I’m wearing MAC ‘Please Me’ layered over MAC ‘Angel’. This look is absolutely stunning; I can’t wait to try it out next week :) The green really makes your eyes pop! Gorgeous look! I have got brown eyes and I really like purple smokey eye. I added a post a couple of days ago. This looks beautiful. With my brown eyes, I always lean towards purple or taupe. I’m so inspired right now! Do you get your eyebrows threaded or tweezed?? They look perfect here. Hello..I am a new reader..and I should say am absolutely stunned by the pictures..you look breathtaking in all of them..and your makeup skills seem exquisite..I am definitely going to be stopping by so much more…PS- I already did try a combination of the topsy-turvy ponytail and the blake lively braids..I loved the result..thanks.. I just stumbled on your blog and holy moly, you are BEAUTIFUL!!!! 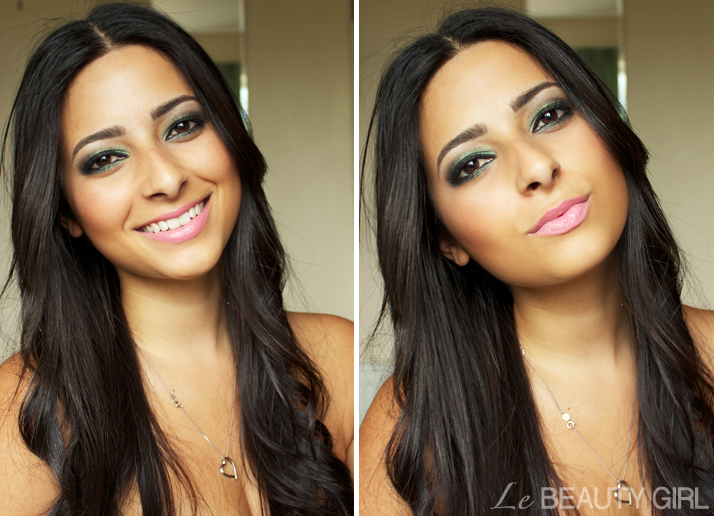 I also LOVE this green look with your skin color and eye color! Amazing! I’m lighter skinned but have brown/green eyes and am super excited to try something like this! Thank You! !